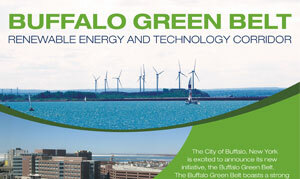 The Buffalo Green Belt development, in the city of Buffalo, New York, is a renewable energy and technology corridor. The growing green economy, in the western New York area, takes advantage of its position as a Great Lakes transportation hub, as well as its industrial infrastructure and educated work force. The city of Buffalo, New York is excited to announce its new initiative, the Buffalo Green Belt.